Trunkster is an American company produces one of a kind carry-on suitcases. These suitcases are built for tough situations and constant traveling. Boasting of various features, the Trunkster traveling bags are made for your every need and much more. With Big Apple Buddy’s personal shopping service, you can now buy direct from the Trunkster online store anytime, anywhere. There's no other suitcase like the Trunkster! This unconventional luggage is tougher than most but remains sleek and stylish. Nothing is more unique than the sliding rolltop door instead of the usual suitcase zipper. Now it's easier to get your stuff out without struggling with locks, broken zippers, or other annoying mishaps. Best of all, it's a better option for theft protection so you have one less thing to worry about. It's more than just a tough suitcase - the Trunkster is also water resistant, drop resistant, and impact resistant so there's nothing it can't handle. You can even charge your phone! With the built-in USB charger can always come in handy when traveling. If you can't find an available power outlet at the gate or need it right away, the Trunkster has everything you need to handle your problems. Airlines can be very strict about your suitcase's weight. Now you don't have to worry about it anymore! The Trunkster has an integrated scale to let you know if you've gone too heavy or not. Best of all, you'll never have to fear losing your bag ever again. 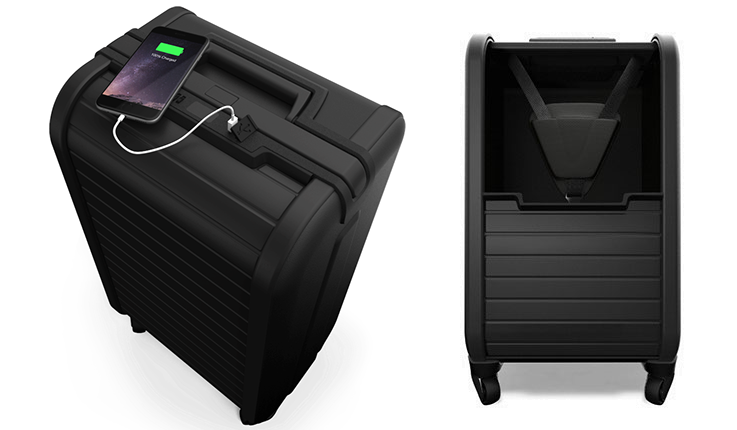 This carry-on has found a way to keep with the Trunkster Tracker on your radar at all times. No matter where in the world you go, you'll know where it is. Unfortunately, the USA Trunkster online store does not currently offer international shipping. However, Big Apple Buddy, your personal shopper, can help you buy products direct from the official USA Trunkster online store and ship them to your doorstep, no matter where you are in the world. We offer international shipping to over 110 countries including Australia, Austria, Azerbaijan, Bahrain, Belgium, British Virgin Islands, Brunei, Bulgaria, Canada, Chile, Costa Rica, Croatia, Czech Republic, Denmark, Estonia, Fiji, Finland, France, French Polynesia, Germany, Gibraltar, Greece, Greenland, Hong Kong, Hungary, Iceland, Indonesia, Ireland, Israel, Italy, Japan, Jordan, Kuwait, Latvia, Liechtenstein, Lithuania, Luxembourg, Macau, Malaysia, Maldives, Malta, Marshall Islands, Mauritius, Monaco, the Netherlands, Netherland Antilles, New Zealand, Norway, Oman, Poland, Qatar, Romania, San Marino, Saudi Arabia, Serbia and Montenegro, Seychelles, Singapore, Slovak Republic, Slovenia, Spain, South Africa, St. Lucia, Sweden, Switzerland, Taiwan, Thailand, the UAE, the UK, Vatican City, and Vietnam. If you would like to buy from the USA Trunkster online store, simply let us know which items you would like to order (by filling out the form below) and we’ll get back to you with a free international shipping quote within 24 hours!